Have you heard about the fabulous eco-care package website Citrus Lane? This is the perfect baby shower gift for the eco-conscious parent! I wish they would have had this when E was a baby. What a wonderful idea to sample brands and find what you love. Citrus Lane is a gift package website that you can buy a 3, 6, 12 month subscription to or a deluxe baby shower box. Every month a box is delivered for your newborn to age 3 yr old or for moms-to-be. This is seriously a gift that keeps giving! Every month the boxes change, so you will never receive the same items. Each box is $25 and during the month of January, a portion of the proceeds go to Healthy Child Healthy World. 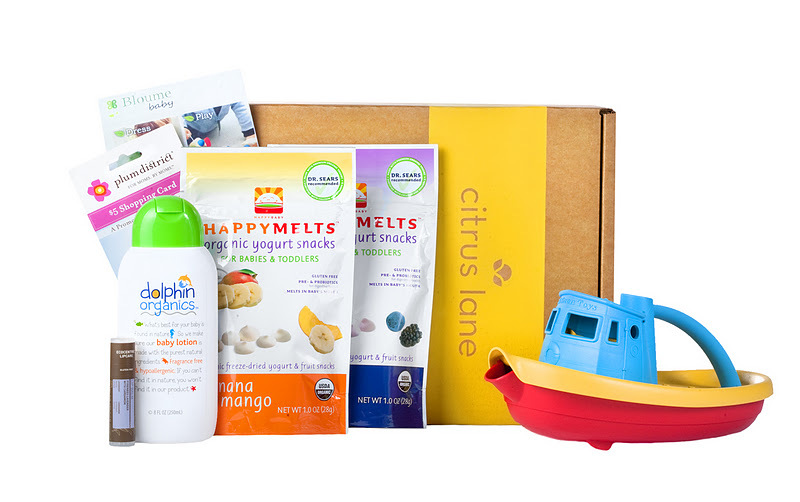 The limited-edition Healthy Child Healthy World box, curated by their Executive Director, Rachel Lincoln Sarnoff, features non-toxic products from brands like HAPPYBABY, Green Toys, BabyGanics and Dolphin Organics to help educate families on safer and healthier alternatives for the home and your baby’s nutrition. I can’t wait to see the box to try out some of the goodies- thanks Healthy Child & Citrus Lane! Past Citrus Lane boxes have includes items from PlanToys, Clean Well, aden + anais, cloud b, eco-kids, iPlay, miYim, Plum Organics and more! Giveaway: One lucky winner will receive the limited-edition Healthy Child Healthy World box! !